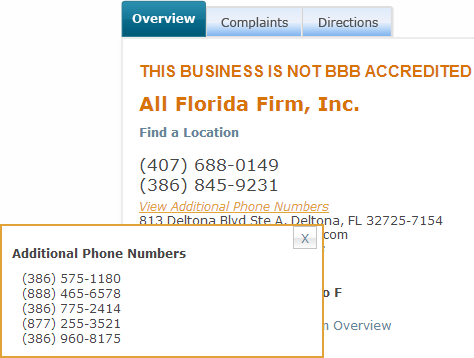 One Phone Number for Multiple Google My Business Pages: Can It Cause Problems? I tend to suggest using a different phone number for each location of your business, but exactly what’s the downside of using the same number on all of your Google My Business pages? Google’s guidelines don’t tell you to use a location-specific phone number. “Merged” Google pages don’t seem to be a problem these days – and even when they were, a shared phone number probably wouldn’t have caused pages to merge. I’ve seen businesses use one number for many locations and rank just fine – and you may have observed that, too. Google My Business forum Top Contributors don’t indicate that a shared phone number is a big problem (though it’s “not ideal”). Some of my fellow local-search geeks suggest using separate phone numbers – and I agree with that advice, generally. But I haven’t seen anyone spell out exactly what might happen if you use the same number everywhere. Here’s one possible downside: Google may not verify one or more of your pages. 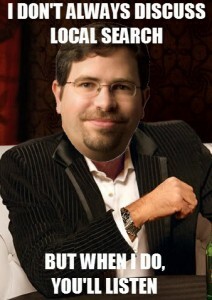 That happened recently to a multi-location client of mine. They chose to use the same phone number for their 5 (or so) Google My Business pages in different major cities across the US. 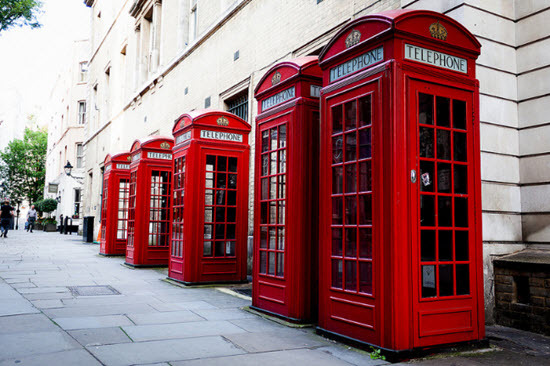 Though I’d suggested getting and using different phone numbers – one for each location – their choice also made sense in their case. They’d had a couple of GMB pages up for a few years, and created the others in recent months. They verified all their GMB pages without incident, except for one page. The client got on the phone with GMB support (always a good time), and they were told that the problem was that the phone number wasn’t unique to that one location. Of course, that was also true of the other pages, which had been verified A-OK.
After some back-and-forth and presumably a little groveling, the client got Google to wave the page through. All’s well that ends well. But what about your situation? If you’re multi-location, should you use a unique number for each of your Google My Business pages? I wouldn’t say a multi-location phone number is like giving your rankings a Kent Micronite. If you get all your pages verified, your visibility will depend on the usual suspects. Still, I recommend using a unique phone number, if at all possible. You’ll make it a little more apparent to Google and to searchers that you’ve actually got people in all the places you say you do. What’s been your experience with using the same phone number (or different numbers) on Google My Business? Have you heard of any specific problems resulting from using the same number across the board – or heard any strong advice? 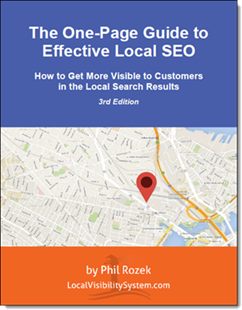 This is one of the few posts I’ve done that’s probably more applicable if you’re a local SEO geek than if you’re a business owner. But I hope it’s useful in either case. 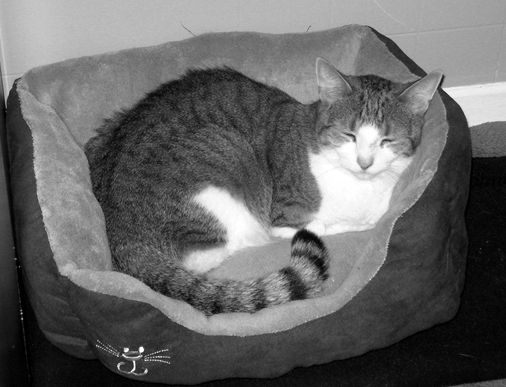 As you probably know, having inconsistent NAP info floating around the Web can hurt your rankings (a lot). You’ll need to correct those listings. But first you need to find them. That can be tricky if you’ve had different phone numbers, different addresses, different business names, and different websites. For instance, you can’t always just Google the phone number and see all the listings you need to fix, because some of them might use other numbers. 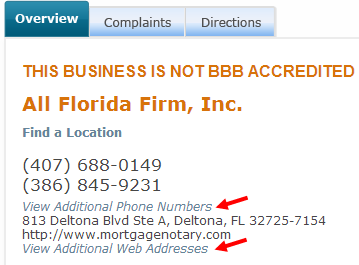 Then click on “View Additional Phone Numbers” and / or “View Additional Web Addresses. You can’t copy and paste any phone numbers from the popup bubble, which is annoying. You can just check the source code of the page and grab the phone numbers that way (if you find that easier than typing). But wait – there’s more! Scroll down the page. 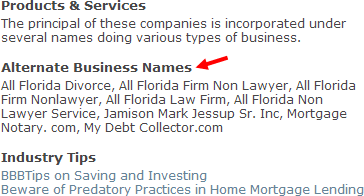 You may see “Alternate Business Names” listed. Checking the BBB page may tell you nothing you didn’t already know. Or it may give you a list of past names, phone numbers, and website URLs that can help you unearth old citations that need fixing. Either way, Gentle Reader, the real work has just begun. Google MapMaker is like the NSA: Many people know it exists or at least have heard of it in passing. But few know much about it or what goes on there. MapMaker is one head of a two-headed monster. 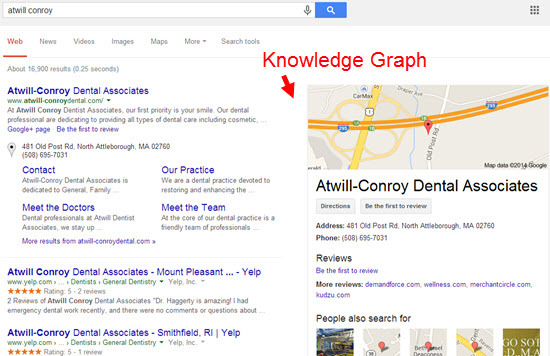 It’s oddly intertwined with the Google+Local (AKA Google Places) search results. The accuracy of much of the “local” info about cities and businesses depends on thousands and millions of little changes that people make to Google’s maps. Many of those changes are made in MapMaker. These little changes can determine whether your business is listed accurately in Google. 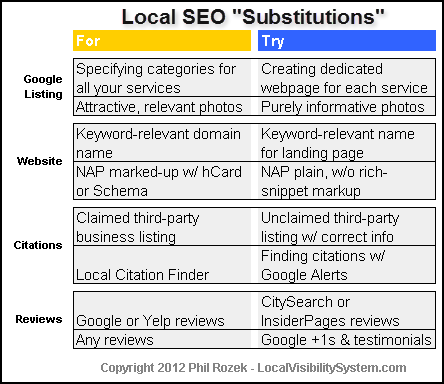 Ultimately, they can determine how visible your business is in the Google+Local search results. 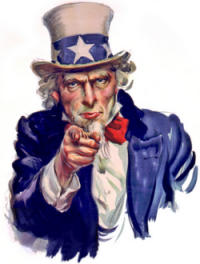 That’s why you should care about MapMaker – or at least know a little bit about it. MapMaker won’t help you win the potato-sack race with your local competitors. But knowing about how it works can help you avoid a faceplant that can cause you to lose that race. The only trouble is that practical, real-world info on MapMaker is hard to come by. It doesn’t get much attention even in local-SEO circles. Because of that and simply out of my curiosity, I decided to interview two people who know a lot about MapMaker: Andrew Sawyer and Saikrishna Arcot. These guys are “Regional Expert Reviewers.” Also known as “RER’s” or “editors” or “reviewers,” they’re among the people who volunteer their time to make the endless number of changes to Google’s maps – and to the local-business info in them. I did my best Mike Wallace, and they did a phenomenal job of answering my questions and providing a TON of insights. To get the inside scoop on how MapMaker affects your business’s visibility in Google+Local and what you can and cannot do with it, read the interview. You’ll want to pull up a chair for this one. How would you describe MM to someone who’s never heard of it before? Andrew: MM is a way for people to provide their local knowledge to update physical features in Google Maps. This takes the form of parks, roads, shopping malls, rivers, etc. MM is the public editable version of Google Maps that is incorporated to provide accurate and up-to-date information from users. Saikrishna: Map Maker is a tool for users to either correct incorrect features (roads, business listings, parks, schools, shopping centers, etc.) or to add new roads or features that they may not own. Under what circumstances would a business owner EVER need to deal with MM personally? To what extent should a business owner care about what goes on there? Providing an accurate address – Places/Community Edits will abbreviate addresses which is not the format desired for Maps. MM feeds/edits the addresses, road names, cities, states, countries for Maps (some of these are locked from editing). While abbreviations may be rendered on the map, the full name is used and required for addresses. If there is an issue with an address, a new geolocated point for the address can be manually entered via MM. By adding a point feature in MM with the category “Address” can be used with just the street address (no names of features) to help set where a particular address is. If an address is already present, but uses abbreviate names “Rd.” the full name of the street name/state/etc. should be selected from the drop down when editing to help locate the place. Checking on the history/troubleshooting their businesses’ feature – Most edits, even those from Community Edits and Google editors, will typically show up allowing any user to view if a feature had anything which would cause issues with bots or other automated edits. Some things that can affect a feature are duplicates/merges, improper name change and/or hijacking another business feature, changing a professional listing (person) to a business feature, issues finding when and/or who made a change to the feature. The Places/G+L cid# it can be used to find the MM feature associated with the one in their dashboard. Adding/editing physical features nearby the business – By watching the MM YouTube videos, reading some MM Help Center articles and asking for help in the MM forum you can quickly gain the knowledge to make edits that will provide more detail about the area surrounding a business. Some features that can be added are parking lots, shopping centers, buildings, access roads, paths, etc. Many businesses are located in a shopping center/strip mall/etc. and if the shopping center is added to the map with a boundary drawn on the map features will be associated with the shopping center in Maps. When a business owner isn’t comfortable making an edit, they can always seek out experienced MM users to help/make the necessary changes. Saikrishna: Business owners should generally stick to Places, since they have a lot of control over their place in Places. 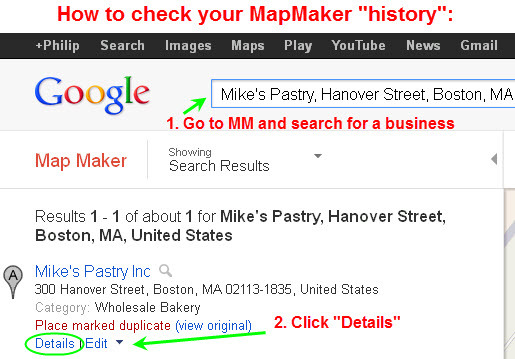 In most cases, the only reason a business owner would absolutely need to go to Map Maker is possibly to delete incorrect names that are showing up in Google+ Local. However, in some cases, if their business disappears from either Places or Google+ Local, they may need to go to either the Places forums or the Map Maker forums or to their feature in Map Maker to find out why their business might have disappeared. If there are sudden changes between what they had and what is there now, or if what they see in their Places dashboard is significantly different from what they see in their Google+ Local page, then they might want to go to their Map Maker feature to see recent edits made. That being said, there are a couple of features that are in Map Maker, but may or may not be in Places. One of these is the ability to associate their feature with a building. If the business is located inside a building, and the building is mapped in Map Maker, then they can edit their feature to indicate that their business is located in a building. If the building isn’t mapped, they can draw a new building, and after that is approved, link their feature to the building. Currently, this will have no effect in Places or Google+ Local, but I’m hoping that one day, we’ll be able to tell the businesses that are in a specific building. Some business owners may see in Google+ Local that their addresses were changed to expand all abbreviations and have the suite number (if applicable) places at the start of the address instead of right after the street name. The reasoning for this is that Map Maker has defined data fields for the address line (where the suite number goes), street name, city, state, and zip code, and Places doesn’t follow this format. In addition, when editing, Places / Google+ Local abbreviates where possible, whereas the data (street name, state name, etc.) is not abbreviated. In order to follow this format, the addresses are changed in Map Maker to match existing data. For whom or what is MM most useful? MM is also most useful for making changes to one’s local area to convey the most accurate information; marking a business as closed, adding a new name for a street (or part of one), correcting the location of a business to its front door, etc. Saikrishna: In my opinion, Map Maker is most useful for general Maps users who have some spare time on their hands, who are fairly familiar with a region, and who are willing to improve features in that region. In addition to end-users, Google Trusted Photographers also use Map Maker either to add a business that is not already on Maps or to correct information about a business in preparation for a photography tour for the business. Other than editors and people trying to spam Google, who uses MM? Tell me a little bit about the typical end-user. Saikrishna: From what I see, the typical end-user are those who want to make a few changes to businesses here or there. Can people also use it to create “personal maps? Andrew: MM should never be used to make personal maps, that should be limited to “My places” in Google Maps. Saikrishna: Actually, if users want to create a map that only relates to them, but is not for anyone else, or the feature they are adding is personal or private, they will need to use My Places in Google Maps instead. What type of person generally becomes a “trusted” (AKA “Regional”) MM editor? What does it take to become one? Andrew: Regional Expert Reviewers, those with enhanced publishing powers for Review (not edits), are typically selected from the most active editors using MM, in the forum and demonstrate a commitment to reviewing/mapping in accordance with MM guidelines. Saikrishna: A trusted Map Maker editor should be familiar with Map Maker guidelines and know how to do things in Map Maker. He/she should also be familiar with his/her area enough to be able to review other people’s edits. Has someone ever hired you specifically for your help in fixing a MM problem? Andrew: No, as a MM user and RER I feel a personal obligation to help people map in a way that improves the map and is in accordance with Google’s policies. While I already have helped many people on the MM, Google for Business and other forums fix problems for free, I am available for consultation. 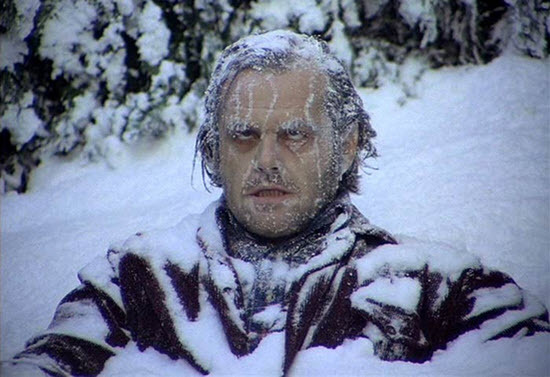 Saikrishna: No (unless you count those asking for help on how to do something in the forums). How do MM problems usually come to your attention? 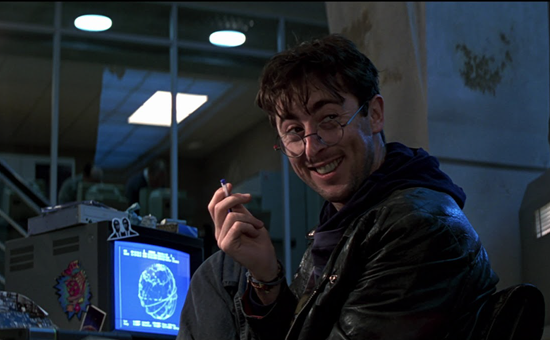 Andrew: I learn of “Problems,” which I define as bad data, from my own personal use of Google Maps and MM, friends who tell me they can’t find an address/business or that it’s mislocated, the MM forum, the Google for Business (“Places”) forum, the Local Search Forum, and news articles. Saikrishna: Mainly through both forums and Map Maker itself. I typically edit businesses in my area and sometimes find problems with features. What kinds of local search -related problems have their roots in MM? Andrew: Merges and/or duplicates. This is one of the big offenders I see with business owners claiming a feature thinking it is “Dentistry Unlimited” because that’s what the primary name on Maps said it was, or marking that feature as a duplicate of the existing “Dentistry Unlimited” feature associated with a claimed feature in Places. 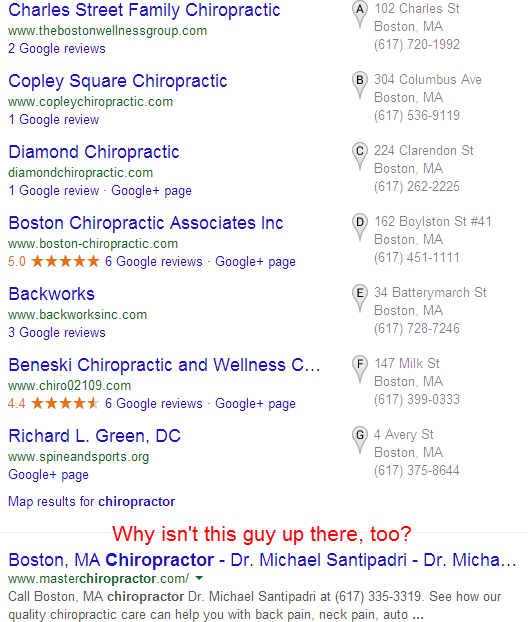 Google allows dentists to have ‘Professional Listings’ as a way for people to locate the doctor directly instead of the business; unfortunately people or bots will place the business name in the name of the feature instead of the person’s name which sometimes will be modified in a manner that conflates the professional listing with a business listing. Because name changes to businesses, etc. require closing a feature and creating a new one, bots will mistakenly add information to what should be a professional listing but has been claimed by someone representing a dental practice. This is especially problematic when someone retires and another professional comes into the same practice and the same professional listing is used. Business owners and others should take the time to check a feature’s history in MM to go all the way to the beginning to see if it was improperly renamed or marked as a duplicate in a manner that would present problems with bots. Saikrishna: If their business is not appearing in the search suggestions, it may be that the business has been marked as a duplicate of another feature or marked as closed. However, this could be attributed either to Map Maker or to Places, as a bot there may have marked a business as a duplicate of another. If their business is not appearing in Maps at all, then it could be that their business was removed, either from Places or Map Maker. What checks can a business owner perform in MM to tell whether there’s a problem that affects his/her business? Andrew: See earlier comments [answer to question #2]. Saikrishna: A business owner could check to see if there have been major changes to their feature (if their feature is removed, marked as closed, or marked as a duplicate of another feature). These three changes could be an indication that their place may no longer be searchable in Google Maps. If their feature is removed, it may be because the feature was in violation of Places guidelines. If their feature is marked as a duplicate, or if your feature is not appearing at all in Maps, then I would recommend going to either the Map Maker forums or the Places forums. If a business owner has concluded that his/her business has a problem in MM, what course of action would you suggest for that person? Andrew: Business owners should only turn to MM when using the Places Dashboard is ineffective or MM is better at accomplishing the desired result (in accordance with Places and MM guidelines). For business owners wishing to use MM, the best course of action is to start their own thread in the MM forum, including the city/state/country in the subject line. They should describe their issue in a factual manner (avoiding blame accusations, etc) and being straightforward about their business and the feature. The MM forum is largely user-to-user, and more experienced users like myself only have a certain amount of time and energy to contribute. If someone is being belligerent and/or shady they are likely going to not receive as much assistance as if they were honest and forthcoming. I have helped give people advice on how to bring their non-compliant features into compliance because they were able to provide me the information I needed to give them proper advice. Others, I just moved onto the next person and/or just reported their feature to Google for internal review. Saikrishna: If it’s a simple change (incorrect address number, incorrect marker location, etc. ), and their Places Dashboard is correct, then editing in Map Maker would probably be fine. If it is more complex (missing in search results, marked as a duplicate, etc. ), then I would recommend going to either the Map Maker forum or the Places forum. The rest of Google’s maps / local search system is notoriously full of problems. What are the big problems in MM? Andrew: Bots making edits that combine information from a variety of places into one feature and/or merging features incorrectly. This is predominant on college campuses with the main college feature having the names and phone numbers of departments and organizations added to the main feature. Saikrishna: Some of the problems in Map Maker (which is also shared in Places) is that a feature may be marked as a duplicate of another feature by either a Places bot or a Map Maker bot when it’s really not, possibly because of similar names or similar phone numbers. This causes the “duplicate” feature to eventually disappear from Maps, and a new feature may have to be created. 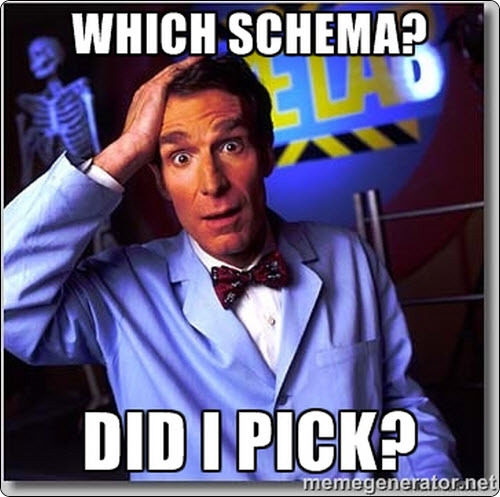 What are some common shenanigans that some people – particularly business owners or marketers/SEOs – try to pull in MM? Hijacking features of competitors and changing the name or phone number to their own/someone else. Having multiple features at different addresses for one business. Trying to game the system by making edits/reviews in MM to build trust within MM to gain an advantage. Power users and other experienced editors usually spot these pretty easily and report them to Google. Such schemes usually result in someone having their trust level manually reset by Google or their account suspended/deactivated. Saikrishna: While this isn’t specific to Map Maker, one fairly common shenanigan is having too many categories. 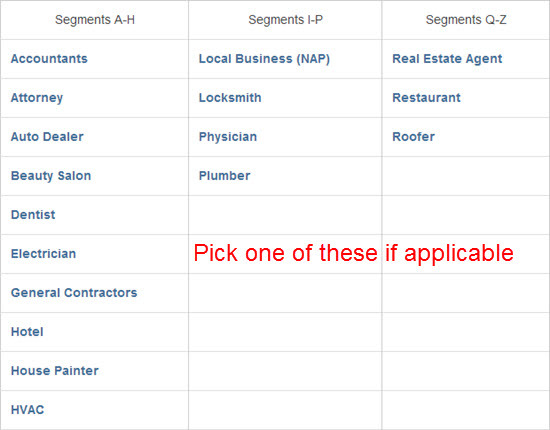 Some businesses type in categories that are not among Google’s list of categories. Some businesses also have the name of the city as part of a category, which isn’t allowed. There are very few cases in which a business should have a category that’s not already included in Google’s list of categories. Another shenanigan I occasionally see is business owners not entering the proper name of their business in the name field. For example, instead of entering “Remax,” they enter “Best Real Estate Office.” This is not allowed, and may lead to problems down the line in regards to their visibility in Map Maker. Another “attempted” shenanigan I see is people entering information about the business in the Description box in Map Maker. They may believe that the description they enter will be visible in the Google+ Local page; however, the description box is essentially notes that don’t go anywhere. 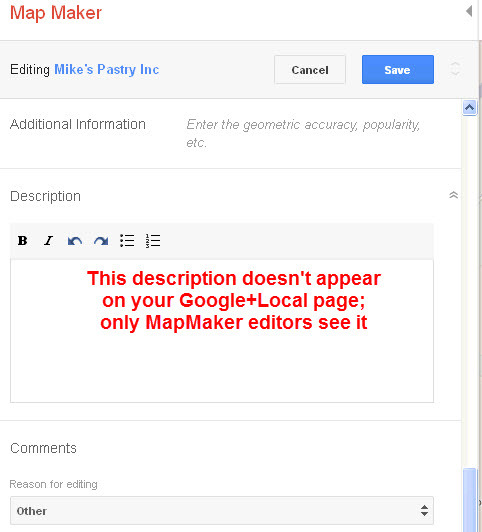 The description that is in Google+ Local can only be edited in the Places Dashboard. What do you think the average business owner should do with MM? Andrew: Learn how to use MM before jumping in with both feet; reading the Help Center articles, watching the YouTube videos for MM and reading the forums is a great place to start. Use MM only to accurately fix issues that cannot be done via their own Dashbord or Community Edits (address, name types, or others). Saikrishna: They can keep an eye on their Map Maker feature to make sure that there are no major changes that are incorrect. If there are any incorrect changes, some of them may be easy to fix, while the others may or may not be able to be fixed. What do you like most about MM? Andrew: I like the ability to make changes that update Google Maps allowing its users to get directions, locate a business or discover what is around them more efficiently and effectively. As an RER, I also enjoy the ability, to quickly push through edits in order to keep Maps up-to-date as possible. Saikrishna: I like the idea of Map Maker itself, that the common man can help in making a better map for their neighborhood, either by adding new roads or adding a new store that’s recently opened. Andrew: In the future I see Trusted Reviewer being added for smaller areas (cities, college campuses) to people in those communities such as planning officials, police dispatchers, etc. who demonstrate proficiency in MM to have better control over correcting inaccurate or abusive edits. Currently most RERs have enhanced publishing powers for reviews on a country-wide basis. Andrew: Android users should go sign up for Ingress, which is currently in beta. It reportedly is a fun game and will help improve Google Maps! Any questions for Andrew or Saikrishna (or me)? How about a great big thank you to these guys for taking the time to share some insights? Leave a comment!